By Amanda Glenn 2 Comments September 12, 2018 This post may contain affiliate links. In the past, I’ve found oatmeal to be great for my breast milk supply, but it wasn’t my favorite thing to eat. That’s because I was doing it wrong! 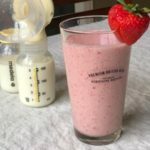 This strawberry banana lactation smoothie is delicious, and a much better way to use oatmeal (and a few other galactagogues) to get your milk supply up. I’ve mentioned before that when I did my oatmeal experiment, the way that I prepared the oatmeal was to put old fashioned oats in a bowl, add water, microwave it for a minute and a half and stir in some Splenda. This … was pretty gross, frankly. I’ve been exploring some much better ways to eat oatmeal and boost your milk supply – including brownies and cookies – and this smoothie is another delicious way that has the same amount of oatmeal as that microwaved mess I used to eat. It also has brewer’s yeast and flax seed as a bonus! To make sure that the oatmeal is ground up as much as possible, I put it in the blender first. Once it’s as finely ground as I think I can get it, I add the other ingredients. I used 2% milk because that’s what I had on hand, but you can definitely try other types of milk. 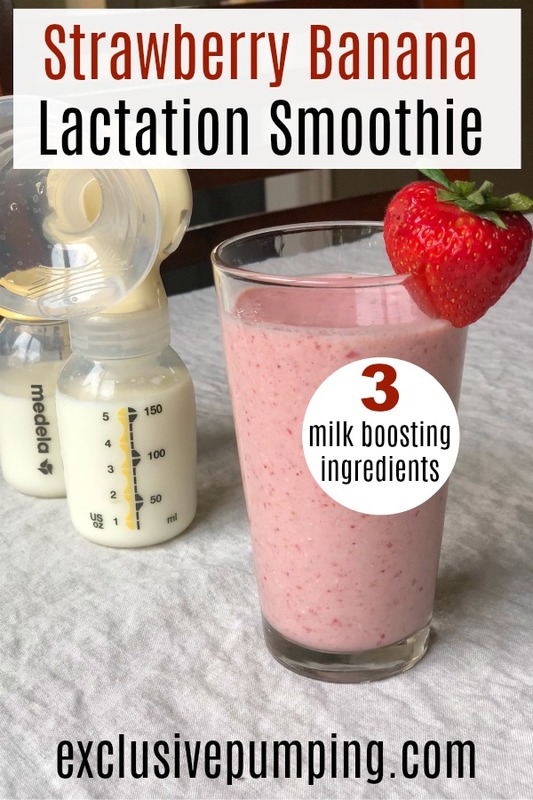 This delicious lactation smoothie has three milk-boosting ingredients (oats, brewer's yeast, and flaxseed) to help you increase your milk supply and keep you full until lunch! Put oats into blender and process until the oats are well ground. You can switch the frozen strawberries and a fresh banana for fresh strawberries and a frozen banana. If both fruits are frozen, you may need to add more milk, depending on how thick you like your smoothies. Delicious. How many should I drink a day? Can I use instant oats intend or just old fashion? Thank you so much! Yes you can use instant! I would do it for breakfast but if you want another for a snack that would be good too!